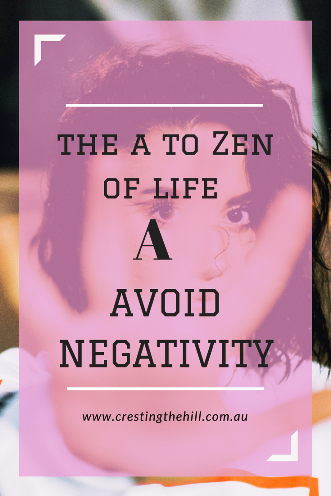 The first letter of my A to Zen of Life (via the Dalai Lama) is A for Avoid Negative sources, people, places and habits – it seems like a bit of a cop-out, but there are times when avoidance is the only way to create some peace and serenity in your life. This one has a strong resonance for me – I seem to be a sucker for trying to fix people and situations. I think my need to be in control and make everyone happy works against me big time when it comes to negative and toxic people and places. 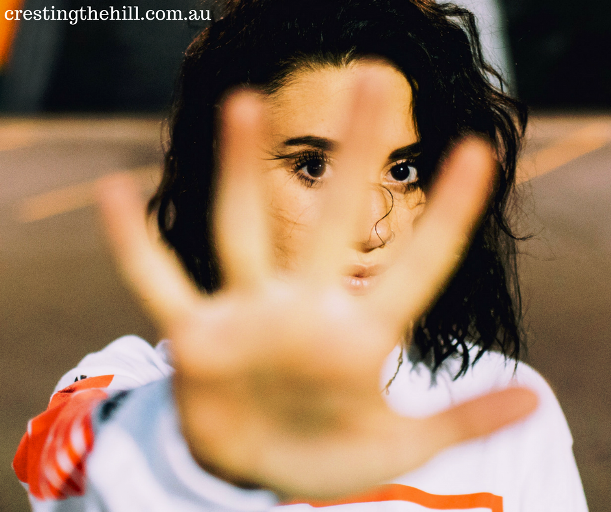 I wrote about this in my post about losing my happiness last year – where I allowed the upset of work drama, and another person taking offence about a post I wrote kill my happiness and my heart. Both of these situations dragged me down and had a deep and lasting impact on my mental and emotional well-being. 2018 has been a time of reminding myself to have some distance from negativity. I’ve reduced my days at work so I am away from the constant besieging (for want of a better word). And I’ve also stepped back from the pain of the damaged relationship by allowing the other person to be in control of how she wants us to interact. It can be tough to not try to fix all those negative and broken areas of life. The ones that I have some influence over I’m working on – my diet, my exercise, my work/life balance – but with the other areas I need to let go and create a safe space where they can’t continually eat at my soul. Avoidance seems like a cowardly way to deal with it, but sometimes it’s the only way to handle toxic or stressful situations. 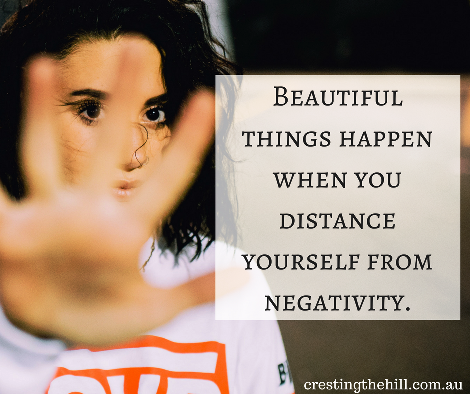 How do you deal with negativity? Do you keep trying to fix things or have you learned to give yourself some grace and create some space? I'm a work in progress with the whole "control" thing Jo - but avoidance is a great tool for moving away before I try to fix the un-fixable! 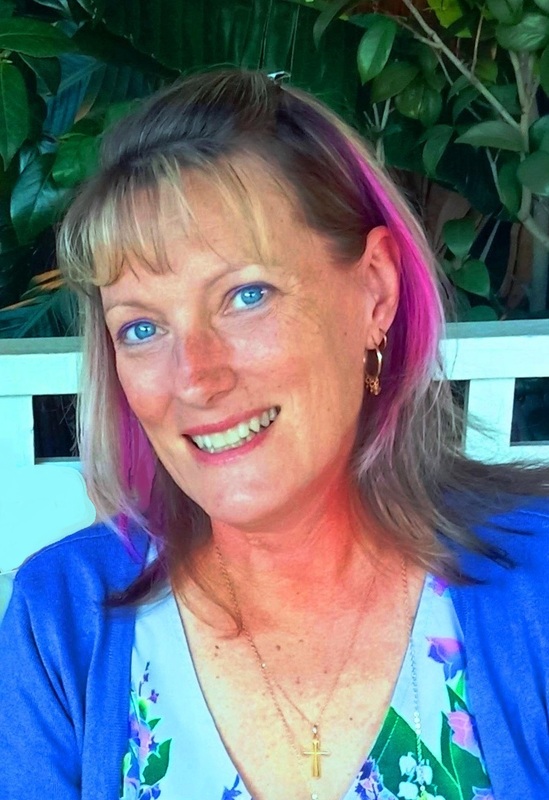 Hi, Leanne - Congratulations on a terrific start to the 'A to Z Challenge'. It is still March 31 in Vancouver...and I won't post until evening....so I have a good 24 hours before my first post is published. I look forward to following your series....let the fun begin! I'm an expert on being sucked dry by negative people Sue (as you well know) so I've learned to avoid putting myself into postions where I know that I'm going to end up being drowned in negativity - it's so much easier than trying to deal with it all the time! Hi Leanne, just wanted to say thank you for linking up at #BloggingGrandmothersLinkParty and I've shared on social media. Ahhh - the belief that it's a cop out to avoid the negative person/situation resonates with me. Like you I struggle with that but, as you said, sometimes it's the best way - just remove yourself from the situation. Lovely word for the challenge. Hi Kalpanaa - I used to feel really guilty about avoidance, now I think it's a healthy alternative to being drowned by people and situations that don't have a resolution - life's too short to be sucked dry! I'm better at avoiding than at fighting, but "letting go" is definitely not my strong suit. I feel responsible for everything and everybody - up until a certain point. If I notice that people take advantage of me over a period of time, I'm cutting them off cold turkey. They're usually shocked. I'm a fixer and a bit of a control freak Tamara - that's why avoidane has become more appealing to me - if I don't get embroiled, then I don't have to dig myself out afterwards! We often don't realise how negative some situations might be on us. And sometimes we think we are strong enough to handle things that then turned out to be stronger than us. I think at this point we need to take a step back, or at least a step to change our attitude toward those toxic situations... which is easier said than done most of the time. But I also know people who seem to go after toxic situations. Then they are miserable and moan the horrible world they are living in, but in a big way they are the ones going after that horrible world. I've met a few people who seem to enjoy being swamped with drama - and they want to draw me into it - I keep thinking I can help them and that is my downfall. Now I've come to realize that taking a step back is the healthiest option with these type of people - and it saves my mental health! Hi Akshata - you are so right about saving our sanity - some people thrive on talking and going over and over things - often with no resolution. Now I find that leaving them to their drama and taking a step or two away is the best thing for me. No, avoiding is not a cop out. It's a it like the Serenity prayer where you accept what you cannot change. Stepping away is often the wise thing to do. I like the comparison to the Serenity prayer AJ - it makes a lot of sense when you look at it in that light. I have faced both negativity and positivity which is why I named my first book "Negative V. Positive. I wish you well with the challenge, first year I have not taken part. That's a terrific start to the challenge! Avoidance indeed is the key :)! Great starting point! Negativity is such a creativity killer, and letting it go is definitely one of the best things anyone can do for their own peace of mind. You're right Debbie - when you get drawn into other people's negativity it shuts down the joyful part of you and you lose all those lovely happy, creative aspects while you cope with the drama - avoidance helps solve that dilemma. Rather than being a cop-out, I think that avoidance is an excellent form of self-care. We can't change other people's attitudes, but we can protect ourselves from being infected by them. Just as you wouldn't feel guilty about keeping various wildlife out of your house (skunks and snakes come to mind), you don't have to allow negative people to take up residence in your life or in your mind/heart. You're off to a great start, Leanne. That's such a great way of looking at it Karen - self-preservation is such a vital skill - and sometimes we sacrifice it with the best of intentions but it's not always in our best interest - especially with consistently negative people. I know I'm much more prone to feeling stressed and anxious when I start trying to think of ways to fix situations or things over which I have little or no control (such as people!!!). For me that also ties in with trusting in God's sovereignty, being mindful of my own responsibility, and even accepting my powerlessness in some situations. Wise advice Leanne, to focus on the things you do have some control over! I think I look at things as maybe it's God trying to improve my character by putting testing people and situations into my life - but sometimes I think it's about learning to create healthy boundaries and working out what is mine to take on and what I need to leave to God and the person involved. First, thanks for your visit to my Letter A...so glad to see you again for the challenge. I've added you to my AtoZ Blog Roll so I won't miss a single one of your posts. This Letter A post really fits me to a T with trying to be a 'Fixer' and make everyone 'Happy'. Such good advice and heartfelt words to save one from heartache, stress and negativity in general. I agree....Let it go! You're on my bookmarked AtoZ too Sue - I enjoy all your nicknacks and interesting collections so I was happy to come back for more - and it's interesting to see how many of us have the "fixer gene" where we try to make everyone happy - often at our own expense. I think the Let It Go song struck a chord with a lot of us Alana - it's been a big lesson in life for me to realize I can't control the outcome and I can't help everyone - sometimes I just need to step back and let others work through their problems and consequences. As the oldest child I am a fixer also. But as I have grown older I tend to step away from negativity more. My thought now is if I can't add something positive to the situation I will add nothing. Perfect advice Victoria - I might keep that in mind for future encounters - adding positivity or stepping away seems to be a good gauge of how to deal with tricky situations. I think we all seem to reach that point in life where we realize we can't always have the outcome we'd like and it's okay to leave certain things to their own devices and outcomes - I think it's a sign of wisdom to be able to figure that out! Avoidance is something of a negative word! It suggests that one is not facing up, or 'dealing' - neither of which is the case for you. You have faced up to the part you have in things and are dealing with that the best way you know how to keep the cart from tipping. The plain fact is folks' egos are attached to who they think we should be and if we don't match their blueprint of us, they can get very cut up about it. We must always check ourselves for what we say and do and the effects they have, but we cannot - and ought not - take on the responsbility of how another will react. We can only ever be responsbile for our own actions and reactions. You are not Avoiding... you are Adapting as a mode of prevention - and that is a case of positivity in the face of negativity! Hi Yam! Thanks so much for stopping by and for having a browse around - I love that we've connected and I'll be popping over to do the same with your blog. Your thoughts on the avoid/adapt interpretation are really helpful - I think you're right about it being a case of learning how to deal with situations and if it means having some space then that's what we need to do. Leanne, Giving myself permission to let go... my language for your "avoid the negative".... was a huge deal this past year. Giving myself the permission to not feel guilty about removing these people active from my life was a big deal. But the loss of that stress keeps reminding me it is for the better! Great start to your A to Z. You said it perfectily Patricia - it is about letting go and not feeling guilty for stepping away from people who aren't good for us - it's learning to not let guilt affect us that is part of the process isn't it? Enjoyed this post, Leanne. We've agreed already that we'd have a number of overlapping topics! My N is for Negativity! Well there you go Shirley - we'll be reinforcing each other's lessons as we go! A great topic for an 'A' post! And so true. I'm with you and believe that sometimes we must remove ourselves from certain situations or relationships. If our health or mental state is going to suffer, we have to think of ourselves first. Great post! Thanks Trisha - and yes, I think there comes a time when we need to let go of the idea of trying to help others who don't see that there is a problem. I'm learning that can be earlier in the piece now - before I'm emotionally exhausted! Refusing to take in negativity and work toward being a part of a better world is more acceptance than avoiding. Sometimes we just have to shift away from what we know is not working. It is simply part of being a conscious being. Can't wait to read the rest of your entries. I'm enjoying people's alternative word to avoidance Nancy - I like your "acceptance" and also another suggestion - "adaptation". Both are really positive spins on what is essentially the need to preserve our own sanity in the face of ongoing negativity. I think avoidance is definitely a way to look after ourselves when things become too much. Avoiding something that we know will add to our stress is taking care of our mental health. Enjoy the A to Z. It's getting the balance right isn't it Pam? Helping where you can and stepping back when it becomes too much. My life became far more peaceful when I learned to avoid negativity. Nearly all drama stems from interacting with negative people. You can still have them in small doses, but balance is the key. Great post! You are so right Heather - I think it's something we learn as we go along - my problem was that I allowed things to go too far before I took back my power and drew a line in the sand. Now I'm back to normal it is such a relief and such a lesson in respecting myself and creating healthy boundaries. Great start to your A to Z, Leanne. Life is too short to waste on negativity. I focus my time and energy on positive sources and people. I'm learning to do that too Natalie - it's never too late to reclaim your sanity and to set some boundaries and delete people that don't accept them. I do the avoidance, too. But I've also started trying to see the negativity as a positive. What's the other person's perspective? Or what can I gain from this situation? It doesn't always work, but the first actual habit it created was in traffic. Deciding that slow traffic was helping me not get a ticket or an accident was very freeing! Hi Leanne, I'm with you on the avoidance issues! I've been in a similar work situation and it was very difficult to regain my sense of self. I wish you well o your strategies you've taken this year and I know I'm going to enjoy your A-Z posts! I know some people who drain my energy with their negativity. It took me a lot of years to learn it was okay to keep my distance from that. I'm stopping by from the A-Z challenge. Today I blogged about ahimsa, or nonviolence...and I think that avoiding negativity is one way to practice nonviolence towards ourselves and others. I also want to fix things or serve people so I stay around negativity for much longer than I should! Avoiding negativity is a great practice. I try not to be a negative person, but I can get sucked in when things aren't going well. I wrote about perspective today, which helps me to avoid going down the negativity road. I am such a Pollyanna, and I really dislike it when people are negative all the time. There is a silver lining in every situation, if you're willing to look for it. Some people would just rather be negative.